Marvels of grace, balance, beauty and simplicity... This Classic Chess Board is designed for use with 19th Century Staunton chess pieces. 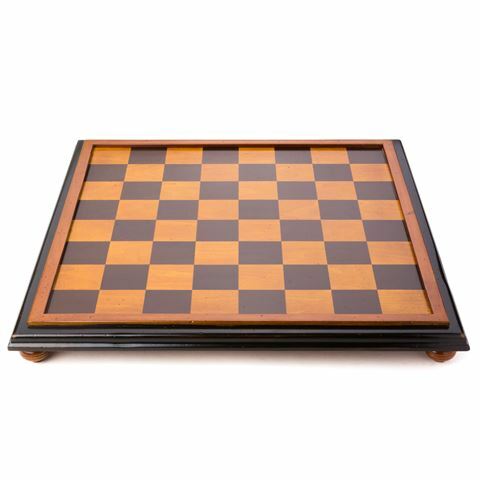 It's crafted from wood with a polished finish, and stands on four stable feet, so you ensure that your pieces will remain stationary while you play. Intended for the smart and sophisticated, who like a board on hand, maybe even set aside for a night or a week, to be engaged at any time, ready for attack. That is the life of a beautiful board and game. It's not only the strategy and battle of minds matter, but also the aesthetic appearance that attracts and pleases. Made from hardwood with a polished finish. Includes for feet for stability. Designed for use with Authentic Models' Staunton Chess Pieces, sold separately. Dimensions: 42cm (w) x 4.5cm (h) x 42cm (d).